Culms: Erect to decumbent, branched at base, hollow, glabrous, bright green or waxy. Blades: Mostly flat, 3 to 12 inches long, 1/10 to 1/2 inch wide, bright green, sparsely soft-hairy above, smooth beneath, surfaces ridged or unridged; auricles prominent. Sheaths: Usually shorter than internodes, glabrous or lower sheaths sparsely soft-hairy. Ligules: Very short, membranous, truncate. 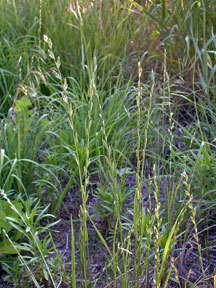 Inflorescences: Spike, erect, slender or stout, loose to compact, 2-sided, 2 to 7 inches long. Spikelets: Arranged in 2 rows, usually single at each node, erect, sessile, nearly cylindric or slightly compressed, 3-8-flowered, 2/5 to 3/5 inch long, spikelet side toward rachis; glumes shorter than spikelets, opposite or placed edge to edge on outer side of spikelet, lanceolate, 1/5 to 1/2 inch long, 3-7-nerved, slightly leathery and rigid, gradually tapering into awn or awn-point; lemmas 1/3 to 1/2 inch long, upper progressively shorter, rounded on back, strongly nerved, awnless or awns to 1/4 inch long. Habitat: Disturbed areas, pastures, roadsides, fields, lawns, and gardens; moist soils. Forage Value: Provides fair forage for livestock and deer and can be used for hay. Uses: Turkeys and prairie chickens eat the seeds. Comments: Quackgrass is a cool season grass designated as a noxious weed in Kansas. It is aggressive and difficult to eradicate.